Allegra (Anderson) Denehy ’95 moved to Holliston, Massachusetts, to raise a family. It was 2006, and Denehy had a 2-year-old and a baby on the way when the family moved into a four-bedroom home in a brand-new development. After her second child was born, Denehy suffered two miscarriages in one year. She didn’t think her experience was that unusual. Among her friends and neighbors, she knew a number of women who were dealing with miscarriages or fertility problems. Allegra (Anderson) Denehy ’95 enjoys time with her daughter, Tessa. Denehy considered the other children in the neighborhood with health and developmental issues, and the adults with cancer. She wondered what might be in the water. So began a decade-long investigation into Holliston’s water quality. As Denehy now knows, Holliston’s wells draw from very shallow surficial aquifers — water-bearing sand and gravel layers 40 to 50 feet thick, which were deposited when Ice Age glaciers retreated. They lie atop fractured granite bedrock ledge, the same ledge underlying the homes in her development. As Denehy began researching the water, her questions piled up and answers were frustratingly few. In 2013, she decided the case needed some outside intervention, and reached out for the research expertise of her alma mater, Clark University. Clark’s Department of International Development, Community, and Environment (IDCE) and researchers from the Boston University School of Public Health/Department of Environmental Health Science partnered with Holliston residents to conduct an investigation that eventually encompassed researchers from the Icahn School of Medicine at Mount Sinai in New York and the Department of Bioengineering at the University of Illinois at Chicago. The collaboration has drawn the attention of concerned residents, the media, and legislators. The initial findings raise questions about residents’ exposure to contaminants that “have national and global significance for aquifer protection and human health,” according to the researchers’ December 2017 article published in the online journal Water. Thirteen of the article’s 16 authors have Clark ties, including Denehy; IDCE professors Timothy Downs, Marianne Sarkis, and Yelena Ogneva-Himmelberger; and nine students in IDCE’s Environmental Science and Policy Program: Bilin Basu, M.S. ’15, Brian Caccavale, M.S. ’17, Stefanie Covino, M.S. ’15, Ravi Hanumantha, M.S. ’18, Kevin Longo, M.S. ’17, Ariel Maiorano ’15, M.S. ’17, Spring Pillsbury ’17, M.S. ’18, Gabrielle Rigutto ’16, M.S. ’17, and Kelsey Shields, M.S. ’15. Birgit Claus Henn, an environmental epidemiologist at BU’s School of Public Health, was the article’s lead author. Like many New England towns using shallow aquifers of similar geology, Holliston has highly variable but quite often moderate-to-high levels of the metal manganese in its drinking water. But naturally occurring manganese is not the only issue. The researchers reviewed hundreds of archived documents on five waste sites — three legacy sites and two existing ones — concluding that “solvents and metals have been reported in soil, soil water and groundwater [at sites in Holliston] since the late 1960s.” By viewing geographic information science (GIS) maps created by Ogneva-Himmelberger and the IDCE students, residents could more easily grasp threads of information that had been publicly available for years, but had never before been integrated to yield a complete picture. Denehy — who had been joined in her pursuit of the facts by two neighborhood mothers, Marcie Randall and Nichole Cordon — had waited patiently for solid information after nearly five years of phone calls to local and state government officials, medical doctors, and university researchers, hundreds of hours conducting online research, and dozens of meetings in neighbors’ living rooms. 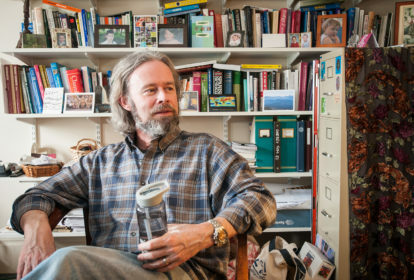 The addition to the project of BU’s Claus Henn, an environmental epidemiologist, was essential for understanding the health significance of the findings to date. Her prior research has linked children’s exposure to naturally occurring manganese — both in the womb and during their first few years — to neurodevelopmental cognitive deficits and behavioral disorders. The researchers sought to further explore the link between Holliston’s water, manganese, and children’s health. Last summer, they sent the baby teeth of children from 30 families to be analyzed by Manish Arora, an environmental epidemiologist and exposure biologist at the Icahn School of Medicine. Arora has found teeth to be biomarkers of toxic exposures; he has uncovered lead exposure in the 250,000-year-old teeth of Neanderthals and has connected tooth abnormalities with autism, attention deficit hyperactivity disorder, cancer, and Lou Gehrig’s disease. As Clark magazine went to press, the results from Arora’s analysis of the Holliston teeth had not been reported. In her early investigations, Allegra Denehy grew concerned about what seemed to be a disturbing pattern. “The more people I talked to, the more I found there were a bunch of weird or unexplained medical issues on my street, especially among kids,” she recalls about the decision to contact Clark researchers. Her daughter, Tessa, had been born with one kidney, and later was diagnosed with autism and epilepsy. Cordon’s daughter had open heart surgery as an infant. Other children had kidney problems, and five were born with rare chromosome 18 abnormalities (Trisomy 18). Anecdotally, concerns exist in the community about the rates of thyroid, breast, and uterine cancer in adults, and rare cancers. 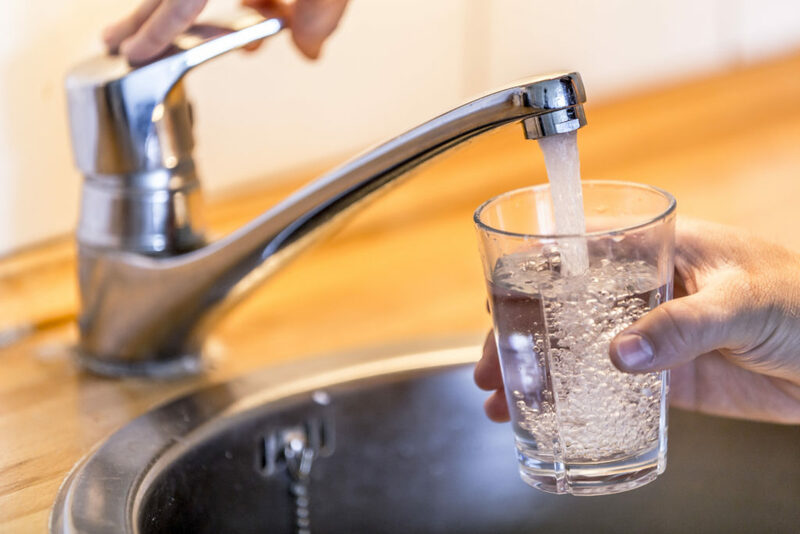 Until the Water article, the plausibility of a connection between health issues and drinking-water quality was neither well supported nor generally perceived by residents. Follow-up epidemiological work is beginning to look into this connection, starting with a focus on children’s neurodevelopment because it is very sensitive to risk factors like environmental pollution, Downs says. Sarkis, a community-based health researcher, and the IDCE students organized meetings with residents. Downs brought his background in risk analysis, environmental science, hydrology, and civil engineering. Ogneva-Himmelberger lent her expertise in health GIS. “We listened, and we were moved by the stories residents shared with us,” Downs says. The residents pointed the Clark researchers to five polluted sites in town: the existing waste transfer station; a combustion research center that tests fire-extinguishing and flame-retarding equipment and materials; the Axton Cross Superfund legacy site (a former chemical reprocessing facility); an abandoned private hazardous waste disposal site; and Lake Winthrop (which exhibits residual herbicide pollution). Collectively, they zeroed in on several “contaminants of interest,” including mercury, trichloroethylene (TCE), trichloroethane, lead, arsenic, chromium, and 13 other chemicals known to pose risks to people who are overexposed. 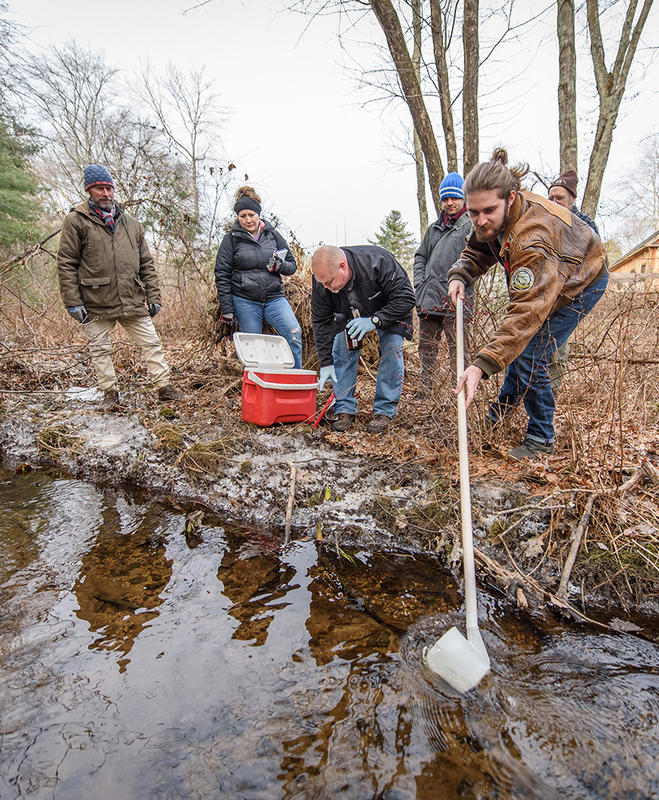 Tom Bossone of Microbac collects a water sample in Uxbridge, Mass. Clark Professor Tim Downs (right) is leading a research team to investigate potential water-quality issues. When Denehy and other newcomers to Holliston first expressed concern about water quality, many longtime residents and town officials believed the brown water to be more of an inconvenience than a health threat — and one easily fixed with filters. The U.S. Environmental Protection Agency, after all, classifies manganese as a “secondary contaminant,” to be regulated for aesthetic, not health, reasons, Downs points out. Yet the EPA also has classified manganese as an “emerging contaminant of interest,” issuing a health advisory in the mid-1990s to advise that infants and children avoid exposure to high levels, he adds. What are the national implications? Looking at maps of shallow aquifers with similar geology to Holliston, and data on waste sites, Ryan Kelly, M.S. ’18, showed approximately two million Americans may be at risk of consuming water with natural manganese contamination, and of those, close to 1.7 million may also be vulnerable to TCE and other chemicals generated by human activity. What can baby teeth tell researchers about water quality? The Holliston study brings to mind famous water-contamination cases depicted in movies like “Erin Brockovich” and the Woburn, Massachusetts-based “A Civil Action.” In each case, one company had released a single chemical that compromised aquifers: hexavalent chromium and TCE, respectively. 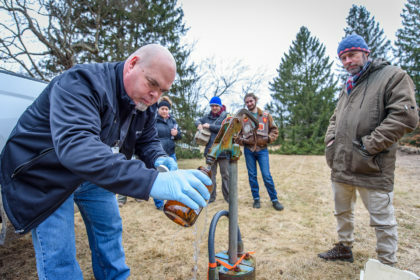 To understand if Holliston has a deeper story to tell, the researchers are now applying innovative methods to detect children’s exposure to manganese and the amount that exists in the town’s water supply. They received seed funding from Clark’s Mosakowski Institute for Public Enterprise and from BU, and are seeking support for a more complete health study. Using laser technology for the teeth study, Arora’s laboratory at Mount Sinai is measuring the children’s manganese exposure from each mother’s second trimester — when baby teeth start budding — to the day her growing child shed the tooth. Thanks to the Holliston parents’ carefully preserved and well-documented “tooth fairy” collections, the researchers had numerous samples from which to choose. Simultaneously, the Clark-BU team is collaborating with Ian Papautsky from the Department of Bioengineering at the University of Illinois at Chicago, to analyze manganese in tap water samples taken from homes in the baby-tooth sample. They aim to develop a portable electrochemical sensor for assessing levels of manganese and other metals in drinking water in situ — at the tap. Currently, levels in water samples have to be determined by a laboratory. Such sensors would facilitate testing done by community members, overseen by researchers, and the creation of maps using these data. Hugh Campos-Martyn ’19 takes water samples in Uxbridge, Mass. Also pictured (from left) Professor Tim Downs, Gia Coleman ’19, Tom Bosson of the water-testing company Microbac, Stephen Lee, M.S. ’19, and Dr. David Tapscott of the Uxbridge Board of Health. The researchers’ focus on shallow aquifers has drawn the interest of other communities in and beyond Massachusetts — and for good reason. The Clark-BU research team has now been asked to bring their expertise to the nearby town of Uxbridge. Downs, Ogneva-Himmelberger, and a new crop of students are working with the community to create a user-friendly “online atlas” that integrates environmental and health information. Uxbridge officials and residents are concerned about two privately owned sites where millions of tons of waste soil, believed to be from Boston’s Central Artery/Tunnel Project (“the Big Dig”) and other construction sites, were dumped, Downs says. The town is involved in a lawsuit with the landowners, and importation of waste soil has been temporarily halted. Steve Lee, M.S. ’19, is looking into the policies and permitting that allowed this soil import with almost no oversight or community discussion, regulation, or planning. Recently, the Clark-BU team and town officials initiated the sampling of drinking-water wells to see if Uxbridge is facing issues similar to Holliston. 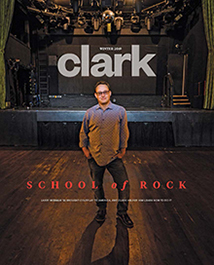 For Downs and Ogneva-Himmelberger, the Holliston and Uxbridge projects exemplify Clark’s broader community-centered approach to scholarship and teaching.